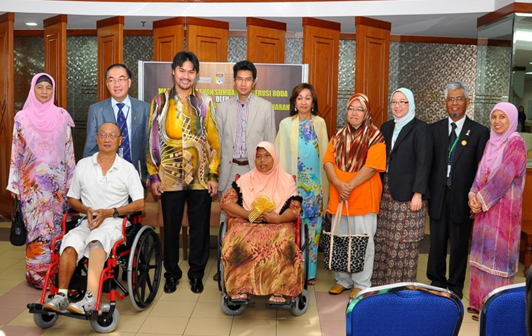 KUALA LUMPUR, 13 Aug 2012 – Yayasan Munarah, a newly setup foundation of the Negeri Sembilan Royal Family has presented 30 wheel chairs to The National University of Malaysia Medical Centre (UKMMC). 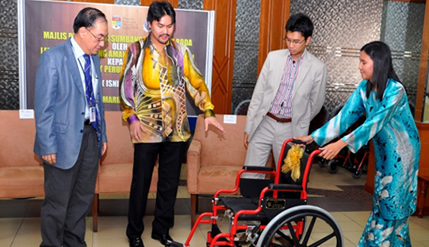 The wheel chairs were handed over by chairman of its Board of Trustees, Tuanku Besar Seri Menanti, Tunku Ali Redhauddin Ibni Tuanku Muhriz at the centre in Cheras here today. Three of the chairs were handed over to three patients especially invited to receive them while the others were handed over to the Director of the Centre, Prof Dato’ Dr Raymond Azman Ali who is also the Dean of the UKM Medical Faculty. The Munarah Foundation, an amalgam of names of the late Tuanku Munawir and the late Tuanku Ampuan Durah, was set up a year ago to collect and adminster charity funds to assist the poor in the field of education, health, the arts and customs, environment and community development. Prof Raymond Azman was proud to receive the wheel chairs, three of which will be given to its Orthopaedic and Traumatology Ward with the remaining 24 given to its Social Services Department for the use of disabled patients. Prof Raymond Azman said the centre has been able to create a name for itself in providing examplary medical care while also being a recognised teaching and research medical centre. It currently has 851 beds, 15 specialists clinics and 36 wards with a staff of about 3,500. Last year it received about 400,000 outpatients with 39,000 patients warded. Though its charges are minimal there are still a sizeable number of patients who not only can’t afford to pay their bills but are not able to pay for the medical equipments they needed, he said.